Professional baseball, basketball, football and hockey athletes compete in 19th annual golf tournament to raise $1.9 million for children’s hospitals. 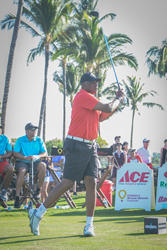 Watch Julius Erving, NBA All-Star, show off his golf skills in support of CMN Hospitals during the Ace Hardware Celebrity Shootout, premiering on the Golf Channel at 8 p.m. ET on March 28. The talent among this group of athletes is astounding, and that includes their passion for supporting the Children’s Miracle Network Hospitals in their communities. Who has more game on the golf course – professional baseball, football, basketball or hockey players? Tune into the Golf Channel for the 19th Annual Ace Hardware Celebrity Golf Shootout to find out. The event, premiering March 28, supports Children’s Miracle Network Hospitals®, a charity that raises funds and awareness for 170 children’s hospitals across North America. The Ace Hardware Celebrity Golf Shootout, hosted by comedian Bill Engvall and award-winning actor John O’Hurley, will air at 8 p.m. ET on March 28, 1 a.m. and 5 a.m. ET on March 29, and 2 p.m. on April 13. The Shootout features some of the biggest names in professional sports at an event known for stunning golf shots at one of Hawaii’s premier courses. Paired in teams according to sport, the athletes will compete in a series of golf challenges, testing their long drive, short game and other talents — all while raising $1.9 million for children’s hospitals. Each athlete plays for their local Children’s Miracle Network Hospital. Tune in to see which fan favorite receives $50,000 to donate to his hospital. The event is being held at the scenic Mauna Lani Bay Hotel and Bungalows in Kohala Coast, Hawaii. The weeklong event began with a reception that included a performance by American Idol winner Phillip Phillips. Since its inception, the Ace Hardware Celebrity Shootout has raised $15 million for kids treated at Children’s Miracle Network Hospitals. Children’s Miracle Network Hospitals® raises funds and awareness for 170 member hospitals that provide 32 million treatments each year to kids across the U.S. and Canada. Donations stay local to fund critical treatments and healthcare services, pediatric medical equipment and charitable care. Since 1983, Children’s Miracle Network Hospitals has raised more than $5 billion, most of it $1 at a time through the charity's Miracle Balloon icon. Its various fundraising partners and programs support the nonprofit's mission to save and improve the lives of as many children as possible. Find out why children's hospitals need community support, identify your member hospital and learn how you can “Put Your Money Where the Miracles Are" at CMNHospitals.org and facebook.com/CMNHospitals. enhance the vision of being the “Helpful Place” in local communities across the country and around the globe through charitable giving. The Ace Foundation provides support and philanthropic opportunities to its consumers, retail store owners, vendors and team members to give back to local communities through fundraising efforts for Children’s Miracle Network Hospitals and American Red Cross Disaster Relief. For more than 90 years, Ace Hardware has been known as the place with the helpful hardware folks in thousands of neighborhoods across America, providing customers with a more personal kind of helpful. In 2015, Ace ranked "Highest in Customer Satisfaction among Home Improvement Retail Stores, Nine Years in a Row," according to J.D. Power. With more than 4,800 hardware stores locally owned and operated across the globe, Ace is the largest retailer-owned hardware cooperative in the world. Headquartered in Oak Brook, Ill., Ace and its subsidiaries currently operate 17 distribution centers in the U.S. and also have distribution capabilities in Shanghai, China; Panama City, Panama; and Dubai, United Arab Emirates. Its retailers' stores are located in all 50 states, the District of Columbia and approximately 60 countries. For more information on Ace, visit http://www.acehardware.com.